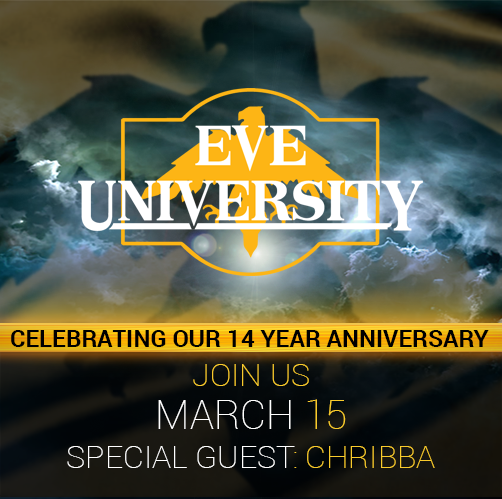 Celebrate the 14th anniversary of EVE University with us! I personally think that this quote from none other than Morning Maniac, the founder of EVE University, encapsulates our mindset to this day. We are the oldest organisation in EVE Online that is entirely focused on teaching and learning and are continuing to successfully induct players into the awesome Universe of New Eden. Many things have changed over the years, but this mindset as well as our complete neutrality have remained the cornerstone of our organisation. We are now nearing the midterm of our second decade in bringing the best learning experience to EVE players in all walks of life. Of course, that calls for a little celebration! With March here, our 14th anniversary is coming up and, our very own Events Department has planned something fun for March 15: we are going to do a fireworks conga line! Our fleet will fly by our campuses, starting in Amygnon and moving from there through to Uphallant. If you let us live that long we might even go through Nullsec unto PC9. We hope to see other people join in the fun as well and bring their own fireworks, preferably the non-lethal type of course, but we fully expect to all die either way. Our tireless manager of events, Turlough Dominian, lover of turtles, has also been hard at work to get in contact with the most trusted person in EVE: Chribba. And as the awesome man that Chribba is, he has kindly accepted to be available for our anniversary. We will be visiting his famous Veldnaught and give it lots of hugs! But he will be more than just a target dummy. We will all be able to sit around the fire on our public mumble and talk to him directly. A special shoutout goes to Danielle en Divalone who helped to establish the contact to Chribba! There will be more events and fleets coming up, so stay tuned on our Facebook page and keep an eye on our Twitter! Please join EVE University in celebrating its 14th anniversary on March 15 (don’t mix those numbers up!). We would be glad to have you all there! This is a perfect opportunity for everybody to clean out there hangars of all those pesky fireworks! The intended audience of these classes are those who are brand new to EVE — those may not understand some of the commonly accepted terminology of EVE — and are designed to take place over 30 – 45 minutes. A brand new player will walk away from the class with a clear understanding of the scope that the subject entails, how to begin practicing some of the more basic activities, and have a better grasp of common terminology associated with that topic. Additionally, a wiki page about C.O.R.E. Classes has been created which explains how to attend these classes. You can also check the EVE University Calendar for classes tagged as [CORE] classes to identify which classes you’d like to attend. As always, all classes can be found on the EVE University calendar and our forums. If you wish to receive class overviews, which include C.O.R.E. Classes, straight to your EVE inbox, you can subscribe to the Classes.E-UNI mailing list using the “Add Mailing List” button in the bottom left corner of the EVE Mail window. If you wish to contribute to EVE University by hosting C.O.R.E. Classes, please see Joining the Faculty. *These slides serve as a visual reference; additional information is provided verbally during class. Thirteen years ago today EVE University was established by Morning Maniac. Since then there have been many changes, but our overall aim has remained the same: To be a neutral, non-profit institution that specialises in teaching players about EVE Online. EVE University has previously had three CEOs: Morning Maniac, Kelduum Revaan and Azmodeus Valar. Each has brought their own individual style to leadership and has helped guide EVE University to where it is today. I am honoured and humbled to be the next person to take up this position. Over the past four years as CEO Azmo has demonstrated huge dedication to EVE University. He has been a source of wisdom and excellent judgement, and EVE University has grown immeasurably under his guidance. Above all he has shown himself to be a thoroughly decent person, and I could not be more thankful to have had the opportunity to work with him as Director of Operations for the past ten months. Azmo has been a Director for nine years, and though he is stepping down as CEO he has kindly agreed to remain part of the Directorship. Many years ago EVE University used to have a Director of Finance, a role that Azmo held for a long time. I am glad to announce we will be resurrecting this position and Azmo will be the new Director of Finance. Over the past few months in particular (with the introduction of alpha clones) EVE University has seen a substantial increase in new players trying the game for the first time, as well as players who are coming back to the game after a long break. It is a privilege to be able to educate so many players about the massive sandbox that is EVE Online. The future will inevitably see changes to EVE University, but it is important that we don’t lose sight of this, our main purpose. My aim as the new CEO will be to build on the strong foundations established by those before me and to help EVE University continue to grow. I appreciate that there are areas we need to improve, and I remain open to feedback and suggestions. EVE University is a community I love being a part of, and I am committed to ensuring others experience the same opportunities. With each ending comes a new beginning. I have had the honor and privilege of being the CEO of Eve University for 4 years, Director of Operations for 6 months before that, and a Director since 2008. During that time, I’ve seen numerous changes within the University, and it is time for me to make one more. Effective March 15th, I will be stepping down as CEO. The choice of successor is the most important choice any leader can make, and I make this one without the least hesitation. Laura Karpinski, our current Director of Operations, will be taking her logical place as CEO of Eve University. Laura has been an invaluable asset to the University and myself, stepping in last summer when real life interfered with my ability to be involved to the same degree that I had been previously. She has been a personnel officer, personnel manager, Director of Human Relations, Director of Operations, and a genuinely decent and caring person during her time in EVE University and I have no doubt she will continue her tradition of excellence as CEO. As for myself, I will still be around and participating to assist Laura in any capacity she needs. EVE University has been my home for almost a decade, and I cannot see myself leaving anytime soon, just finding a new manner in which to assist and balance game and life. During the time I have had the honor to be CEO of EVE University, I hope that I have been a positive force. I’ve changed aspects of the University, but also made my share of mistakes. All I can say is that I hope that my time will be remembered fondly, and step down with the comforting knowledge that Laura will greatly surpass any humble achievements I had. So many of you have helped me over the years that I cannot begin to thank all of you by name. Just know that you have been there when I needed help, offered levity when I was too serious, and been trusted friends and compatriots. Thank you to everyone I have had the pleasure of interacting with over my time as CEO.